You will have to hurry because they are only in town for 4 days until Sunday 29 November 2015. The menu are from Chef Wong's winning entries in the recent Culinary Awards Competition organised by the Hong Kong Tourism Board 2015. The special menu is available for both lunch and dinner. Here's our delicious meal prepared by Chef Wong Wing Keung for dinner. Priced at RM388 nett per person for food only. There is also the option of wine pairing at RM588 nett per person. 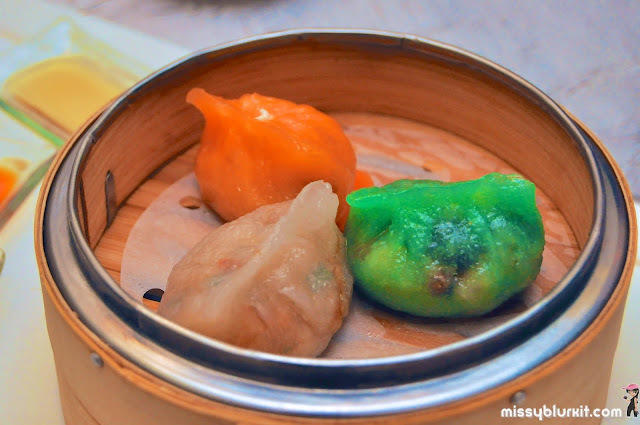 Dinner starts of with Chiu Chow Dumplings in three styles 潮果三弄. 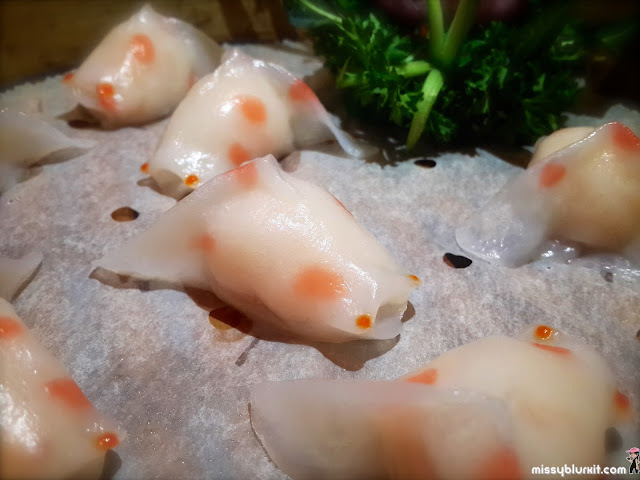 This dish won the Best of the Best Culinary Awards Competitions - Gold Award by The Hong Kong Tourism Board in 2015. A pretty platter of 3 steaming hot dumplings. 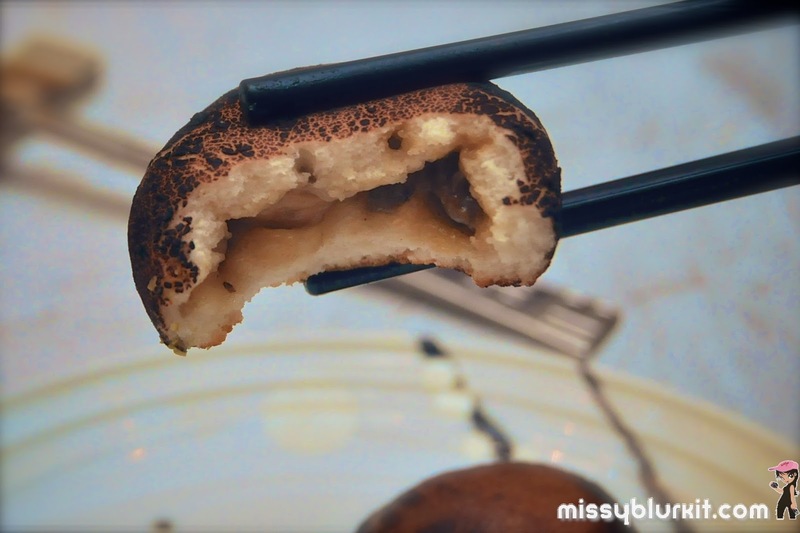 Each delicate dumpling has different fillings but each has a lovely crunch from the turnip with added crunch and flavour from roasted peanut. The skin is not too thick and has a lovely chewy texture to it. My personal favourite is the green one with spinach in it. 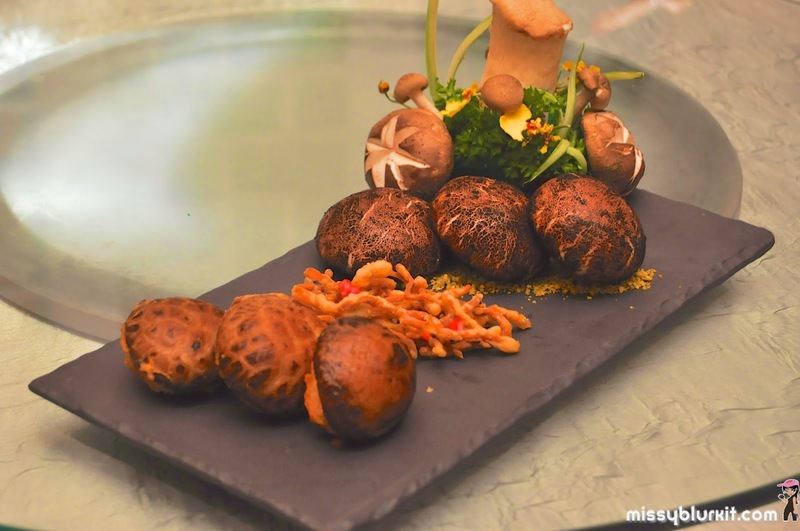 Mushrooms at its best is what I will describe the Twins Mushroom Platter 綠萼紅梅鴛鴦菌. This dish also won the Gold with Distinction Award from The Hong Kong Tourism Board in 2015. I wouldn't mind a mushroom garden like this! Looks like mushroom but this is really not a mushroom. 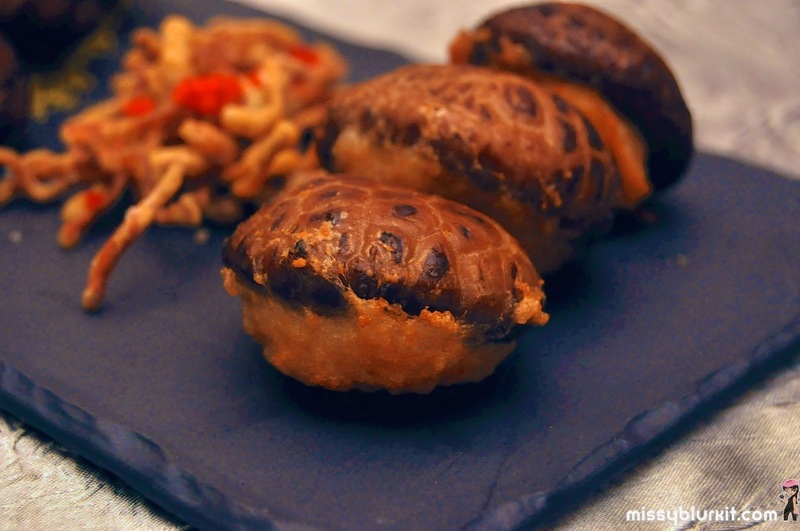 Mushroom bun steamed then panfried for a slightly crispy texture on the outside. Chocolate is used to create the mushroom looking texture. 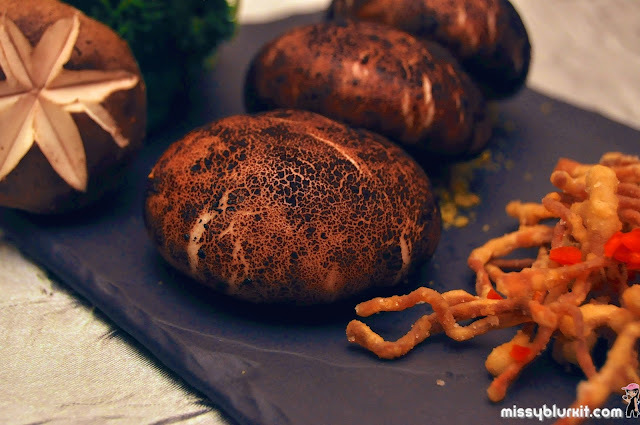 Mushrooms in a mushroom looking bun. 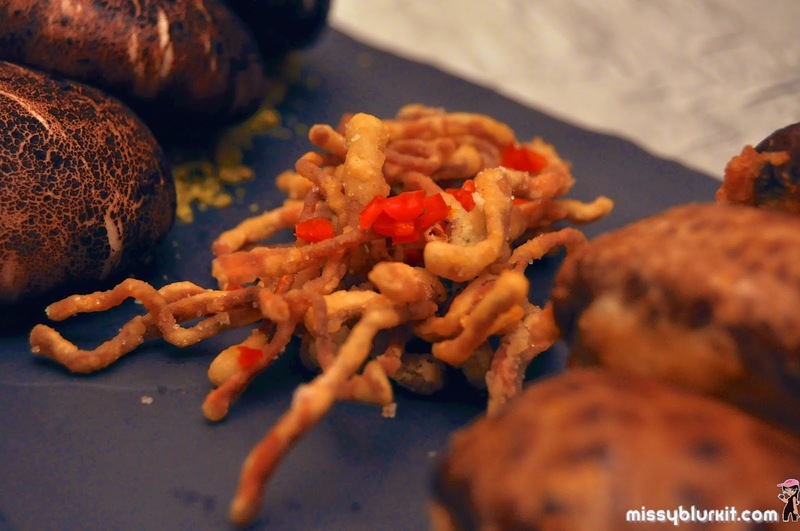 Deep fried cordycep flowers with salt, pepper and chili. Deliciously addictive. No Cantonese meal is complete without at least a soup. Chef Wong Wing Keung wows us with a vegetarian soup. 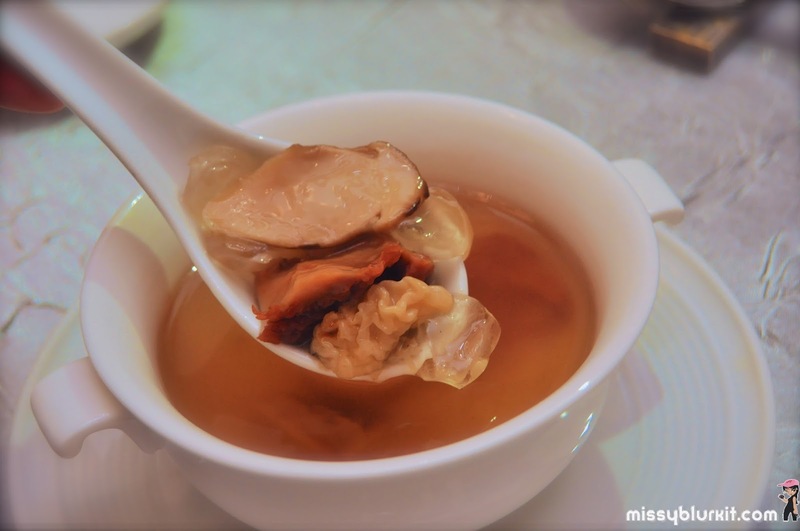 This double boiled honey locust fruit soup with matsutake and assorted fungus 松茸榆耳黃耳燉雪蓮子 is far from bland. Double boiled for 3 hours with a delicious broth cooked from beansprouts, chinese cabbage, carrots and apples. Something light and definitely tasty is the steamed grouper fillet with crab meat and crispy ginger 酥薑珊瑚蒸斑球. Live fish is used in this dish and cooked in a delightful sauce of egg white, tomato, broccoli and crab meat that adds colour and more 'sweet' goodness to this dish. Crispy fried ginger gives it a little play of texture. I can't say much for this simmered papaya with brown fungus in chicken broth 雞汁野生雲耳煮萬壽果 since I am allergic to papaya. 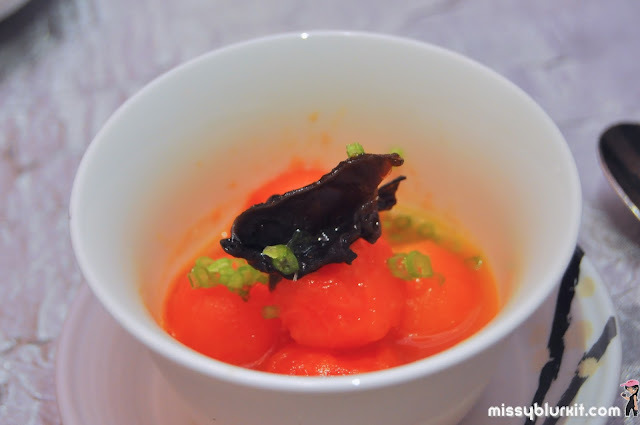 While we rarely see papaya being used in soups in Malaysia with the exception of young green papayas for nursing mothers, Chef Wong tells us that this is a popular soup in Hong Kong. 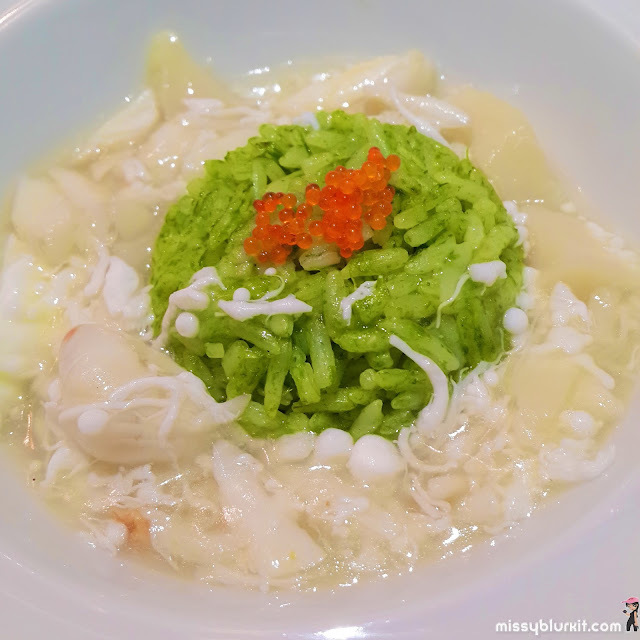 My favourite dish of the night is the braised rice with crab meat and spring onion香蔥蟹肉燴飯. I have always loved the comforting goodness of braised rice. This is different from any others that I have had. The rice is not technically braised. Instead the rice is green from being fried with spring onion paste, giving it a lovely vibrant green and some earthy flavours since only the green bits of the spring onion is used. The braised gravy of crab meat and scallops is then poured onto the rice right before serving. This dish won the Gold Award from The Hong Kong Tourism Board in 2015. Dessert is a platter of 3 popular Hong Kong desserts. 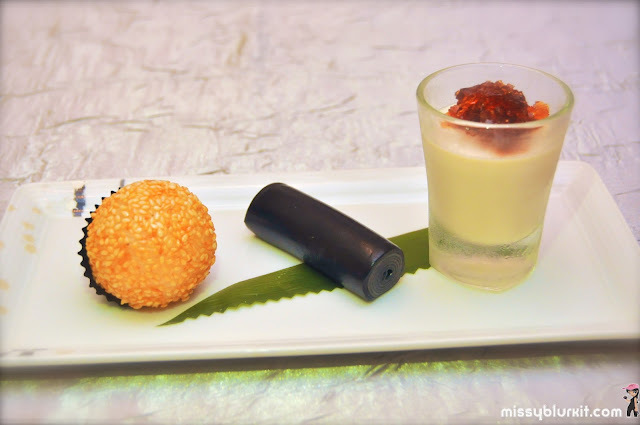 A trio of Chilled ginger milk custard, Black and white sesame rolls and Deep fried mini sesame balls with egg custard 薑汁奶凍, 黑白芝麻卷, 奶皇煎堆. A sweet ending with gorgeous flavours and textures. 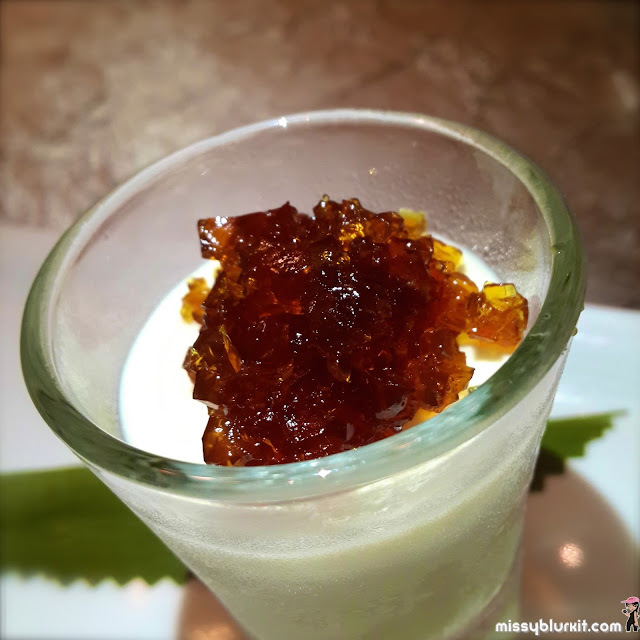 My favourite of the three is the Chilled ginger milk custard. Creamy and sweet goodness infused with ginger pungent topped with brown crystals cooked with brown sugar and ginger. 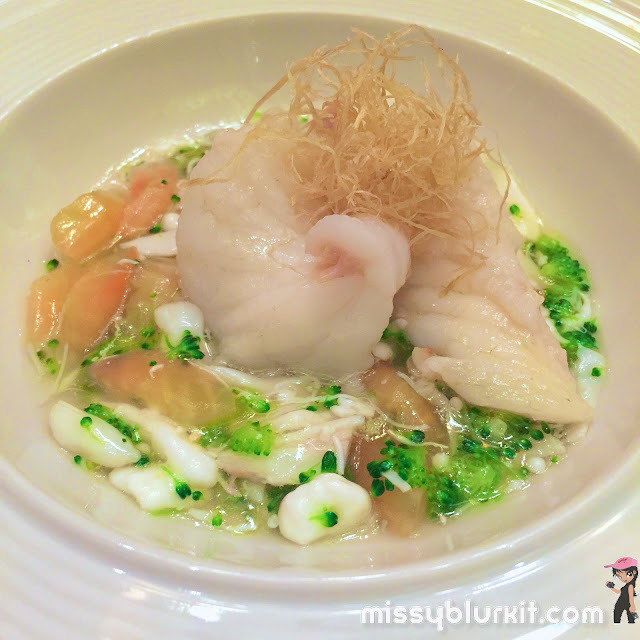 Hopefully this makes its way to Lai Po Heen's regular menu! 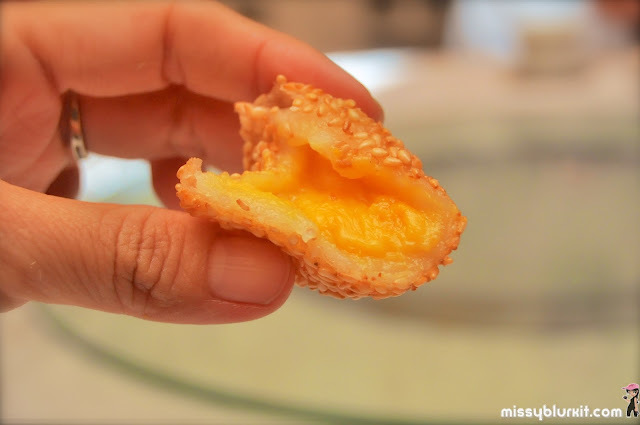 Crunchy sesame seeds, chewy dough and a lovely rich egg custard awaits you in every deep fried sesame ball. Chef Wong surprises our table with an item from his lunch menu. 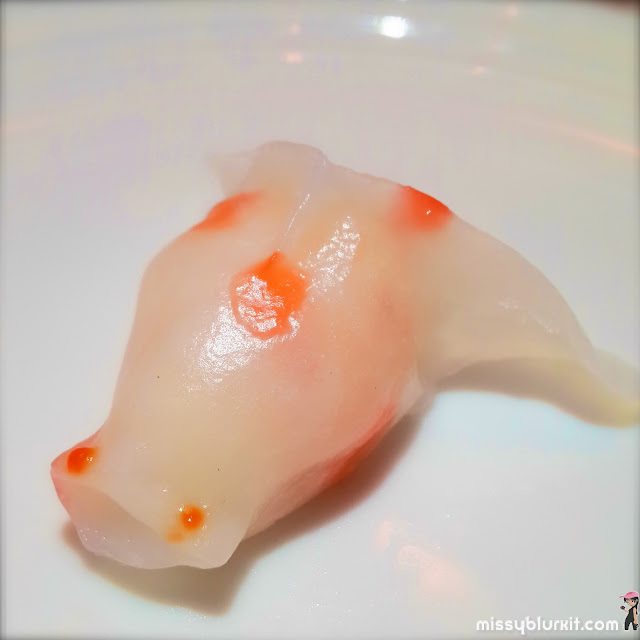 Pretty and cute looking steamed gold fish dumpling. This dish also won the Gold Award for the Best of the Best Culinary Awards Competition. 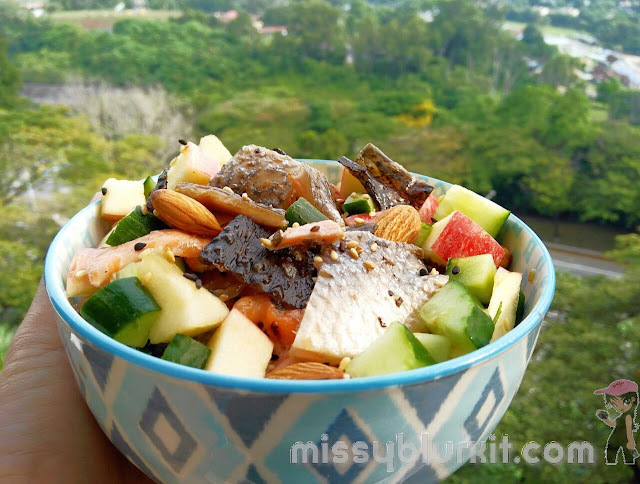 No gold fish was harmed in this dish! 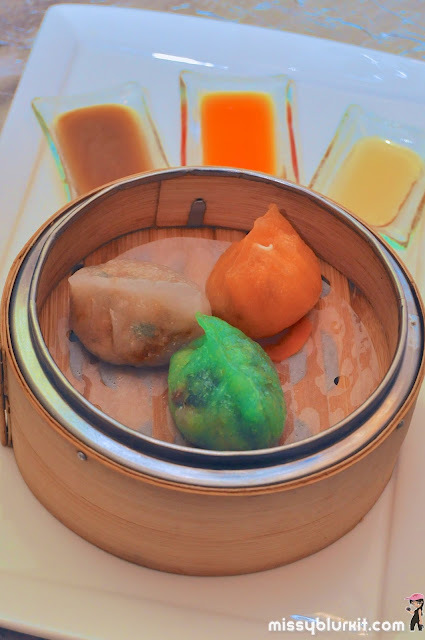 Head on over to Lai Po Heen @ Mandarin Oriental to savour these award winning dishes! You have until Sunday 29 November 2015 to do so!